Okay, you caught me, yes; I am officially in spring mode. It’s not my fault. How much unseasonable warmth can one take before their thoughts turn to bushels of fresh fruit and vegetables? As if that weren’t enough, I’ve decided to do Easter brunch here at my house, so I’m binge-reading through cookbooks trying to figure out The Most Perfect Easter Brunch Menu Ever. Suggestions? Send them my way; I’d really like to try some new things this year. I do know there will be some sort of ham. I’m not huge on ham the way some people worship it, but it’s tradition in Mr. Table’s family, so it’s my one concession to an all-new feast. Maybe. As in, maybe I won’t make that concession. We’ll see. This is my first dessert trial for Easter. 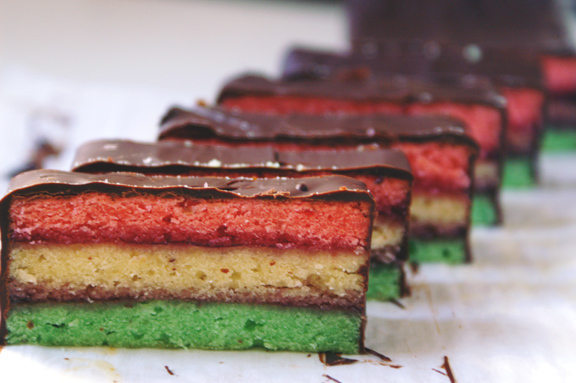 The Baked SuperDuo, from whom the original version of this recipe hails, are right; there are Jell-O lovers and haters, but rarely do you find someone lurking in any gray area. In fact, some of you may have already stopped reading this, throwing your laptop/iPad/smartphone down in disgust, because I have shown you a Jell-O dessert, and the mere thought of jiggly sweetness has driven you far, far away from this post. I get that. I’m not hear to change your mind if it’s made up. But if you’re on the fence, why not give this a whirl. There are lots of things about it to like, and it’s worlds different from just eating a normal Jell-O mold. Even the ones with the fruit suspended in it like little planets in a weird solar system. This one is better. This one has heft. and texture. and it tastes just exactly like a strawberry limeade. How fun is that. For those of you who love Jell-O salads, this should be a no-brainer. My side of the family is a largely Jell-O salad-loving bunch (except for my sister; we don’t know what happened there.) 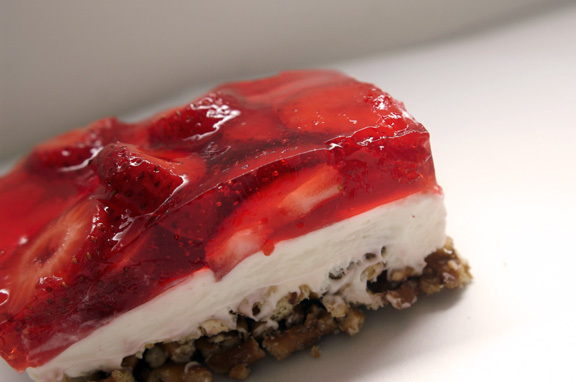 Mom’s side hails from Long Island, so we’re layered Jell-O fans, although there are exceptions, and strawberry seems to be the most popular flavor for us. 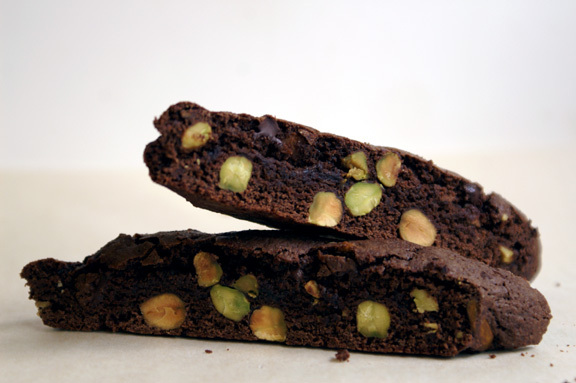 I’ve been wanting to try this recipe forever, but I wanted to do something a little different with it to make it special. I love strawberry and lime together, but I didn’t want to go the lime Jell-O route; Too much work with the layering. Plus, red and green? Total Christmas, and besides, I wanted more of a real lime versus fake lime candy flavor. I ended up using a combination of lemon-lime soda and fresh-squeezed lime juice to get the “limeade” flavor, and it worked really well. I mean, really well. I was a bit nervous going in, and did a test batch of Jell-O only to be sure I liked the ratio of strawberry to lime, and it was exactly what I was going for. If you’re not sure how much lime you want in here, I’d suggest doing a test batch before you start all the layering. With my measurements, you’ll get a strong strawberry flavor brightened up with a lime zing, but not overpoweringly so. Will you taste lime? Yes. Will it be the primary flavor? No. It plays a really nice supporting role, but strawberry is the lead here. Very much like a good strawberry limeade should be. Easy does it with the pretzel-crushing, please. As you can tell from the photos, I chunked mine up by pulsing them in a food processor, but left big pieces intact. I recommend using the tiny twists for this recipe versus the mini sticks or the larger twists. The bends and angles in the small ones seem to work well for this crust. I also sifted the really powdery bits out before adding the brown sugar and butter. You don’t have to be fancy about it; I simply used my hand and a serving spoon and transferred the pretzels out of the processor bowl into a different bowl, and the tiny bits fell out naturally. Another trick to make this work? 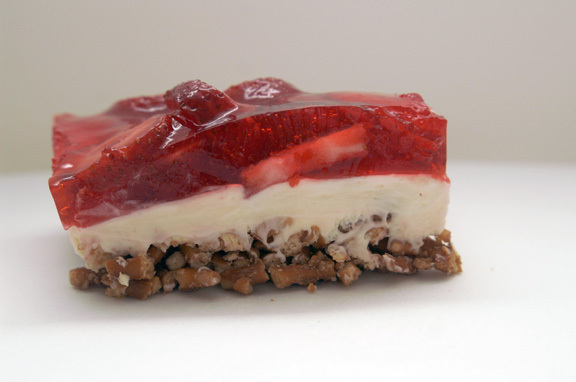 You’ll want to add your Jell-O layer to your cream cheese and pretzel layers when your Jell-O just starts to set in the fridge. You don’t have to time it exactly, although I’ll give you times for it. If you want final layer to be smooth on top and not have any unevenness, give your Jell-O a good swift stir in its vessel prior to pouring over the cream cheese. Don’t be afraid: you won’t disturb the berries. They’re cold and can take minor abuse. Once you’ve broken up any chunks which have formed and made it seemingly a bit more liquid, pour it over. See there? Jell-O smooth as ice except for the strawberries peeping through, just as it should be. You’ll look like a Jell-O professional. Or you’ll look like your grandma, who probably knows that trick already and has refused to share it with you so your Jell-O salads will never compare to hers. My favorite part of this is the tiny fizzy bubbles you should see upon cutting into it. You’ll get that from the lemon-lime soda. 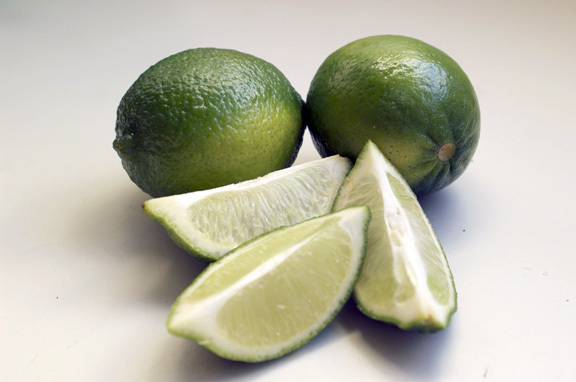 In a bowl, measure out your lemon-lime soda and lime juice. To do this, pour in your lime juice first, then add enough soda to equal 2 cups. Prepare the Jell-O according to the package directions, substituting the soda/juice mixture for the 2 cups cold water. 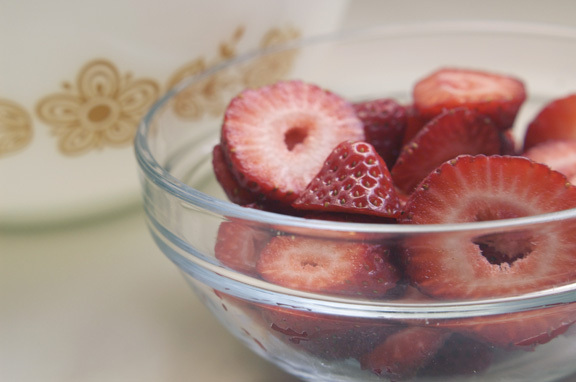 Add your sliced strawberries and refrigerate until it is partially set, about 45 minutes to an hour. While you’re waiting for this, do your other steps. Second: make your pretzel crust. Which, by the way, is my favorite part. Preheat the oven to 325˚F. Butter the sides and bottom of a 13 x 9 inch Pyrex glass dish, or spray it with nonstick cooking spray. 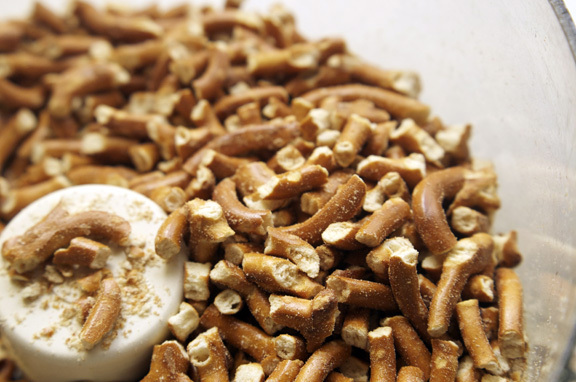 In a food processor, pulse the pretzels into small pieces. Just do the pulse for 1 second at a time, and check to see how the pretzels are doing. You should try to keep them a little bit chunked up as opposed to powdery; it’ll give your salad a really great texture. Don’t have a food processor? You can put them in a big plastic bag and crush them with your hands or the back of a measuring cup. Like I suggested above, remove your post-processed pretzels from their bowl or bag using your hand and a spoon and transfer to another bowl: if there’s powdery bits, they won’t tag along. In a large saucepan, melt the butter over low heat. Whisk in the brown sugar and remove from the heat. Stir in the pretzels and toss together until combined, then turn the mixture into the prepared dish. Using your hands or the back of a spoon, press the mixture into the bottom of the pan evenly, but do not go up the sides (remember: layers, not pie.) Bake the crust for 10 minutes, then set on a metal rack to cool completely. Three: make your cream cheese layer. Put the cream cheese and sugar in the bowl of a stand mixer fitted with the paddle attachment (or in a large bowl using an electric mixer). Beat on medium speed until well combined. 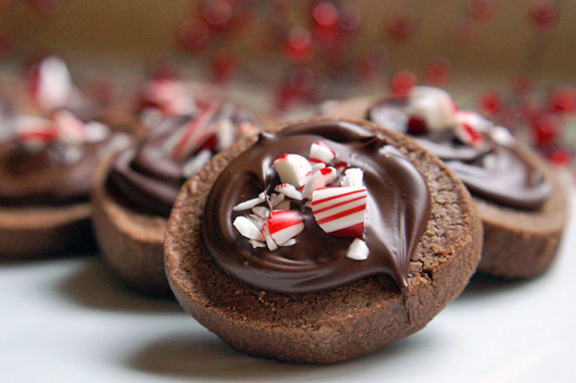 In a clean bowl, whip the cream, either by hand or using a mixer, until soft peaks form. I almost always do this with a mixer and it works great. Use a rubber spatula to fold the whipped cream into the cream cheese mixture. Once you feel like it’s mostly incorporated, run your mixer through the whole thing for about 10 seconds or so until fully incorporated. Four: Get excited. It’s time to assemble. Check your Jell-O mixture to make sure it’s just starting to set. Don’t worry if you feel like it’s already Jelled; remember what I said above about stirring. If it’s ready, give your Jell-O a good swift stir with a large spoon for a few seconds, which should smooth it out, make it look a little less “together,” and break up any chunks of gelatin. 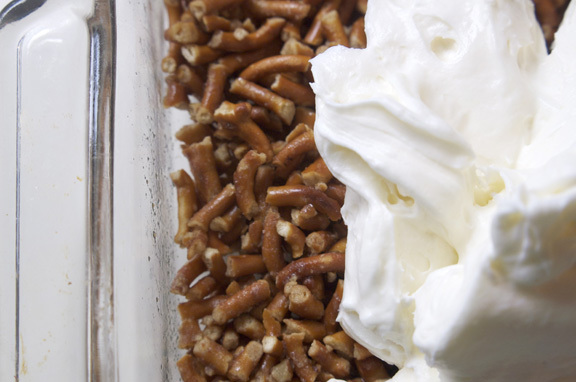 Spread the cream cheese mixture out over the cooled pretzel crust. Chill for 5-10 minutes in the refrigerator. Pour the almost-set Jell-O over the cream cheese layer slowly, moving it around as you pour so you hit all the corners. If you think it needs a bit more smoothing once you’re done pouring, use a rubber spatula to smooth it. 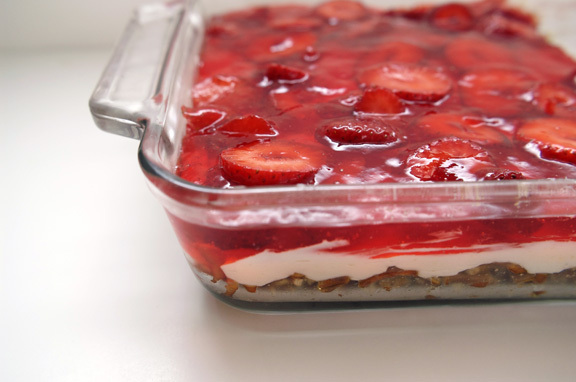 Refrigerate the dessert for about 2 hours or more to set before serving. The Jell-O salad can be stored, tightly covered and refrigerated, for up to 3 days. After that, you start to lose some of the pretzel crunch, and it’s all downhill from there. My brother-in-law has this *thing* for jello. A while back, he asked me to make him a blueberry jello salad. I did it, and he said it was WRONG. He’s very particular about his jello dishes, apparently. So, anyways, I’m off to the grocery store tomorrow. Again. We should have a jello party. With jello. And pineapple upside-down cake. Yay Craig for potentially loving my Jell-O dessert! I hope he likes it in real life…i hate to disappoint. And i’m SO in on a Jell-O salad/pineapple upside down cake party. Pesky internets; makes everyone you meet seem like they live right down the street when really, they CAN’T come over for dessert parties. sigh. My family is a Jello mold family. You know the domed mold with the scalloped sides and the heart in the top? The heart is only used for red Jello, though. My grandma’s red Jello mold is cinnamony in taste, opaque in color, and it has this slightly grainy texture. It’s SO good. I’ve never asked for the recipe, but this three layer salad makes me want Jelloy comfort food like no other. I love that you made Jello with pop. It looks so pretty, and I’m a huge fan of strawberry and lime together. Brianne, i know that type of mold well. I’m intrigued! I wonder what the cinnamony flavor is? My family also does one which is pink and opaque and slightly grainy in texture, but it’s what we call “pear whip” – it’s a strawberry Jell-o/cream cheese/cool whip/canned pears sort of thing. I wonder if your grandmother’s is the same base but with a spicy flavor and minus the strawberries? either way, it sounds DELICOUS. God bless grandmas and their Jell-O desserts. I’m so happy you like my little layer salad! The pop (and boy, do i love that you call it that; you remind me of a friend of mine from high school) makes it brighter and brings out the flavor of the strawberries, which i liked. Oh I’ve had this at parties before, or something similar. I was always wary of it at first but it is good. I am going to try and make a low fat version! it’s one of those “been around for ages, probably” desserts, i think? and a low fat version would be pretty easy to do on this one; low or non-fat cream cheese for regular, and diet soda instead of regular. Although one warning; i wouldn’t try subbing out the heavy whipping cream for a cool-whippy type thing. It completely changes the texture and the firmness of the middle section, and you’ll end up with a saggy salad.